Instant coffee was my introduction to coffee. Taster’s Choice was what we had in our house while I was growing up, for my mom’s consumption (my dad didn’t drink coffee). I remember feeling a grand feeling of accomplishment when I was old enough to be entrusted with making my mom a cup of coffee – I couldn’t have been more than seven or eight years old max, but instant coffee is simple enough that a child can handle it: heat water, add coffee crystals, add milk and sugar to taste. Mom let me try a sip since I loved the smell so much, and being a kid, I decided that if a little milk and sugar was good, more was better!! !, so the next cup I made for my mother involved no water at all but only milk, and probably triple the amount of sugar that she actually wanted. She insisted that she liked it but I think only a mother’s love could have made her drink that overly sweetened beige cup of milk in the end. Sorry, Mom!! Anyway, instant coffee is not something I have spent a lot of time with since probably the mid-1990s, and while I’m aware that the rise in specialty coffee has led to more of a demand for higher-quality instant coffee options (Starbucks VIA comes to mind), I’ve never been terribly interested in trying them out. Firstly, I don’t typically travel many places that don’t have a coffee shop within reach, so I’ve never felt like I needed to carry instant coffee around, and secondly, I place a high value on flavor. If I’m only going to drink 12 oz of coffee a day (which is my usual amount), I want it to be as good as possible. If the coffee can’t be good, I’d rather use the hot water for tea, or go without a drink altogether. 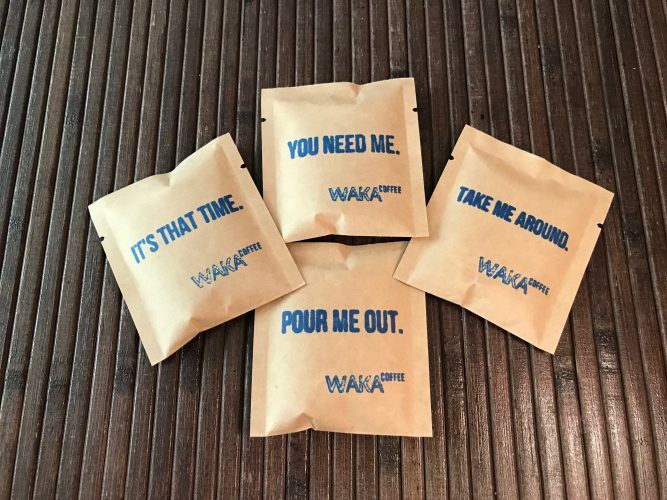 As fate would have it, the folks at Waka Coffee got in touch with me shortly before Christmas and reached out to me about trying their instant coffee. Other companies have asked before for me to review their instant coffees and I’ve always said no up until this point because I just couldn’t imagine myself ever liking it. However, Waka’s website won me over because of their obvious commitment to making as high-quality an instant coffee as possible, and I decided that it was worth a try. Plus, since this was right before I would be traveling for the holidays, I reasoned that I could bring the coffee with me and see how useful it proved while traveling. It definitely was less work than packing a travel grinder or worrying about sourcing fresh coffee beans, and cleanup would be a cinch compared to normal brewing. The coffee came in a slim box, pictured below, that held 8 single-serve packets. 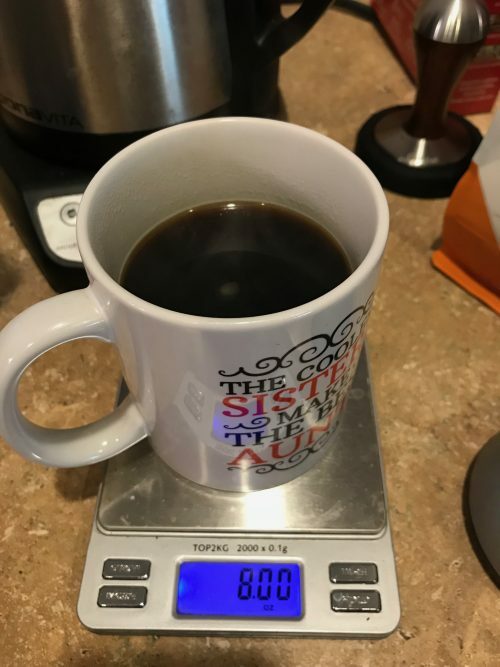 I like my coffee on the strong side, so for my first go, I poured the contents of one packet into a mug and added 8 ounces of water, heated to 209 degrees Fahrenheit (which happened to be the last temperature setting that my kettle was set on). This was an uncomfortably hot cup to drink! I don’t actually care for scaldingly-hot coffee, and since there was no brewing time involved in this, the coffee was painfully hot. Totally my fault. There seemed to be a hint of a soapy aroma at first, but this became less as the coffee cooled to a more reasonable drinking temperature. The coffee itself had a hint of butterscotch, and it got more complex and lighter in flavor as it cooled. While I don’t think I would be fooled in a blind taste test between this instant coffee from Waka and a coffee made from freshly ground beans (the Waka coffee seemed a bit muted somehow compared to what I’m used to), it was definitely a large step up in flavor from any other instant coffee I’ve tried. I made another cup a day or two later, this time with water brewed to a much more drinkable 175 degrees Fahrenheit, and I found this to be much more pleasant all around. No soapy aroma, and a nice balance of butterscotch sweetness with a subtle citrus/orange acidity. Again, not really comparable to freshly ground beans, but for someone that is accustomed to craft coffee, this was a surprisingly decent option over subsisting on whatever’s available at the local Starbucks or convenience store when traveling. I was able to drink this black with no complaints – there was zero bitterness and no unpleasant flavors that I would have felt the need to cover up with milk/sugar. I did end up taking the remaining packets I had with me as I traveled for Christmas, and I have to admit that it was really nice to not have to leave the AirBnB for coffee in the mornings, especially since it snowed a bit during our trip. The rental we had did come equipped with a Keurig, which I dislike just on principle (the amount of plastic waste, the stale coffee, the watery flavor of the brew), but thanks to Waka, I was able to use the Keurig to give me hot water to make instant coffee that was quite a bit better than any Keuring cup I’ve had, and I was able to customize it to the strength I preferred. My sister also tried some of the coffee and was able to stretch one packet into multiple cups of coffee since she doesn’t drink hers quite as strong as I do. 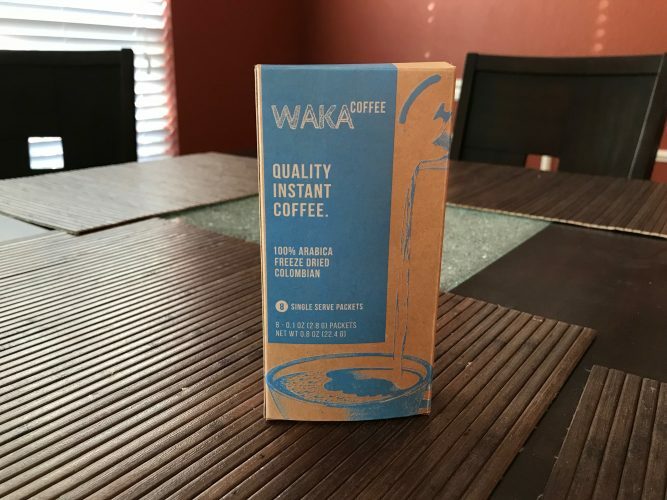 Summary: Waka’s 100% Colombian single-origin instant coffee is a surprisingly good product. 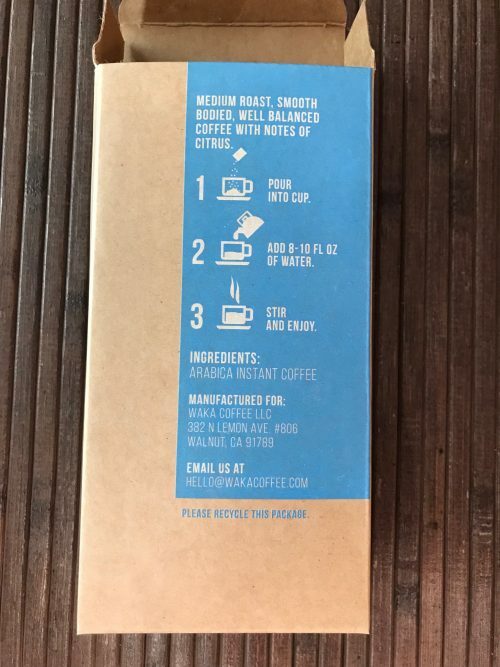 I would not personally purchase this for daily consumption – when I’m at home, I’m sticking with my normal routine of buying local roasters and grinding my beans fresh before every cup – but on the road, this is a much, much better choice than buying supermarket instant coffee, and the convenience really can’t be beat.